Editor’s note: The following excerpt from our exclusive interview with AT&T senior executive vice president John Donovan comes from our Stadium Tech Report for Q2 2014, which includes a wealth of information, research and analysis about the stadium tech marketplace. With a focus on Major League Baseball technology deployments, the report is available free for download so get your copy today. Enjoy the excerpt that follows. In a strategy borne by necessity, AT&T has become far and away the leader in deploying distributed antenna system (DAS) technology in stadiums and other large venues across the country. 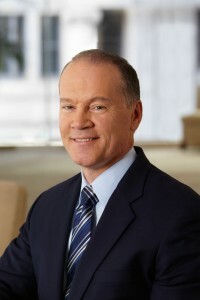 In a recent phone interview, Mobile Sports Report spoke with the man behind the plan, AT&T senior executive vice president John Donovan, who told us the hows and whys behind AT&T’s DAS strategy, and how AT&T is continuing to innovate to improve DAS performance. Donovan also offered some interesting insights about large-venue wireless consumption patterns, based on AT&T’s thorough and varied operator experience, which is likely second to none. With 670 DAS systems deployed in large venues, including 150 in the past year, AT&T has no plans to slow down. In fact, Donovan said AT&T will deploy another 250 DAS systems this year, adding to its impressive totals for presence in large public venues. According to Donovan, AT&T DAS systems are currently active in 75 percent of the “big 4” professional sports venues in the U.S. (football, baseball, basketball and hockey), a list thaat includes 90 percent of NFL stadiums. AT&T also has DAS deployments in a large number of top college stadiums, making Donovan confident that his company is far and away the top provider of enhanced cellular services in stadiums. “We are absolutely crushing the competition on performance in venues,” said Donovan, who 5 years ago spearheaded a move inside AT&T to create a team that specifically targeted large public venues. Now, the fruits of that team’s labors are paying off. The several-hundred strong group, which Donovan said included employees with experience in tower rental operations, building right-of-way negotiations, and “young, aggressive wireless” technicians, had a mandate, he said, to target all the premium venues in the U.S., and get them a world-class wireless architecture. “The objective was, to wire them all, really,” Donovan said. Armed with a large budget (“in the early days, it was ulimited,” Donovan said), the group started ranking every large public venue, calculating stats like “seat minutes,” a value of how often a seat in a stadium would be filled. “The Staples Center [in Los Angeles] blew everyone away — one year they had 367 events,” said Donovan. The main reason why AT&T had to improve cellular connectivity at large venues had to do mainly with the company’s legacy as the initial, exclusive carrier for the Apple iPhone. Though Verizon Wireless and other carriers eventually got access to the iPhone in 2011, AT&T’s early lead meant that many iPhone owners were still AT&T customers — and according to Donovan, the kind of people who bought iPhones were also the kind of people who went to sporting events and concerts. “In the early days, we were the only ones with the problem [of congestion in arenas],” Donovan said. “If you take the demographic of an event, and map it to the demographic of an iPhone buyer, you get a big overlap.” While AT&T may have only had 30 percent of the overall wireless market share, in some arenas Donovan said AT&T’s “internal” market share could represent as many as 75 percent of the fans in attendance. In those early days of a few years ago, with many of AT&T’s iPhones still using older 2G and 3G technology, making them work in crowded arenas was a challenge, Donovan said. Fast-forward to 2014, and the team is in a much different space, innovating ahead of the curve instead of scrambling to respond to pressures. One example of the new thinking is the debut of some large, spherical antennas that AT&T used at the Coachella music festival in April. “We had this huge thing that looked like a human-sized bowling ball with 12 [antenna] sectors in it,” Donovan said. “We’ve got a 20-sector version coming out next year.” AT&T in the last couple years has also debuted antennas that allow the carrier to focus signals into smaller geographical space, to better target the packed crowds in arenas and large venues. “We’ve gotten a lot better at design,” Donovan said. To read the rest of the interview, download your free copy of our Stadium Tech Report for Q2 2014.